Qurrat Ann Kadwani is the founding Artistic Director of eyeBLINK and the head of the Theatre department. She is a theater graduate of SUNY Geneseo and is a double scholarship recipient for her directing and acting contributions. She is currently the host of 100% Desi on Namaste America, a nationally syndicated show on cable (http://www.namastetv.com/watchus.html) TV appearances also include ABC News’ What Would You Do, As The World Turns, All My Children. Her stage work extends to Baby Taj (TheaterWorks Palo Alto), where she earned rave reviews from the San Francisco Chronicle, San Jose Mercury News, India-West, Silicon Valley Metro, talkinbroadway.com, as well as many other publications. In NYC, she has acted in First Language (New Group), Inside Out (Abingdon Theatre Company), The Quaking (Abingdon Theatre Company), Falling Man (NYU), The Greeks (Imua Theatre Company), Beneath the Banyan Tree (eyeBLINK), and six productions of American Colors. She has also appeared in print campaigns for Dansk, Doral Bank, IMAX, and more. She is a proud member of AEA and AFTRA. She is represented theatrically by The Krasny Office. Obaid Kadwani is the Business Manager of eyeBLINK and the head of the Special Events department. He is also an actor, producer, model, tv-host, emcee and entreprenuer. He is the host of the national tv-network "Namaste America." On Namaste America, he hosts entertainment shows such as Admit One, Dhoom Machale and 100% Desi. He also demonstrates his versatility and journalism skills by anchoring the weekly news round-up. He has also hosted Sundance Channel's Doc-Day Night. He has anchored the promotional tv-shows for Bollywood Awards and Bollywood Legends. 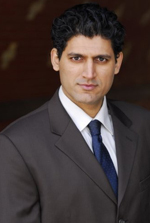 Obaid's excellent improvisational skills make him a natural to emcee live events as well. He has emceed events including Miss India USA, Miss India NJ/DE/PA, Strings Concert, Rockstars Concerts in NJ and NYC, SAAIDS Gala, Nargis Dutt Foundation Gala, Chand Raat, Dulhan Expo and the 25th Anniversary Cultural show of the flagship NYC India Day Parade. Obaid has walked the ramp for many designers and events including Bollywood Fashion Awards, International Pakistan Cultural Ministry Fashion show in DC, several shows for Alia Khan, Zuni Fashions, Nirali Fashions, Zari Boutique, Bibi Magazine and eyeBLINK. Obaid's print campaigns include Zelnorm, IBM, Microsoft, Sun Microsystems, Computer Associates, HP, Altria, Sundance, Ekman project, Nokia, At&t, Verizon, Cingular, Heinz, Target, Panasonic, Hershey's, Reliant, book covers and more. Commericals include a national commerical for Target and local commericals for Aveda Natural Look Saloon, Basmati Rice and a mortgage company. Industrials include Altria, Schering-Plough and Merck. Obaid's films include a cutting-edge short mockumentary called G-hoddie and the Hotties as well as Lovenik, Limousine Drive, The Writer and One Night Stand. Stage includes the original eyeBLINK play Beneath the Banyan Tree as well The Swaggering Solider, The Frogs, The Master Builder and the regional play The Grocer's Daughter. His voiceovers include Walmart, Sprint, Nokia, Orbitz, Western Union and an Urdu voiceover for Mayor Bloomberg's 2006 re-election campaign. He did a very special charity voiceover for a short film raising funds for earthquake relief in Pakistan. He has also done voiceovers for several pharmaceutical companies for in-house use. He is represented theatrically by The Krasny Office. Mahira Sheikh is the Project Manager for Tomorrow's Gold! New Work Series. She was born in Karachi, Pakistan, and grew up in the dynamic Asian city of Hong Kong. She moved to the United States in 2002 for college and currently resides in New York City. She graduated with a degree in Communication, Chinese and a minor in Business Administration with which she is currently putting to use at a boutique market research firm. Travelling is a passion of hers, along with exploring new cultures and cuisines. Mahira believes that open-mindedness is the key to a successful and enriched life. Diversity should be celebrated and embraced through the arts, food, and fashion. She uses her vast experiences from across the world to interpret her surroundings and hopes one day to compile a memoir of her experiences as a citizen of the world. Arif G. Kadwani is the Chairman of the Board. Born in Mumbai, India, Arif G. Kadwani has had a varied career with the US Government in Mumbai, and with a private law firm dealing with US immigration in the US. He is currently associated with a real estate holding company based in New York, N.Y. Mr. Kadwani has a long association with non-governmental organizations for the past 45 years. Mumbai, India organizations include the Cutchi Memon Students' Circle, Cutchi Memon Jamat and the Young Muslims Union. U.S. organizations include the Bharatiya Vidya Bhavan (Institute of Indian Culture), Vraj, and the Cutchi Memon Jamat of North America. He has supported and assisted in the development of artistic activities in India and the US and has the ability to lead art and art-related organizations.